Unsure how to get started with healthy home cooking? We often hear from clients is that they just don’t know how to incorporate healthy home cooking into their lifestyle. There’s no question that cooking for yourself and/or a family is not always the easiest option and can certainly feel like a burden after a busy day of working. Despite this, cooking at home provides a plethora of benefits. It’s cheaper, it’s healthier, and you get to be in charge of what goes into it (especially helpful if you have food sensitivities). Cooking at home can be just as easy as eating out with the right preparation and planning at the beginning of the week. We’re here to help you get there! First, sit down over the weekend (or day of your choosing that works for you) with whomever you are cooking for. Try to plan recipes for the week with everyone’s input. If you have kids (or picky eaters) you can give each person the option to choose the meal for one day in the week. The rest of the weeks meals may not be their favorite but the compromise of having their planned meal in the week can help with the food fight. I find it easiest to plan about 3-4 recipes and eat the leftovers for lunch if there are any. After planning the weeks menu of food, put together a grocery list by categorizing the foods into sections of the grocery store (ex: produce, dairy, frozen items, etc.). This ensures you don’t forget anything and makes everything much easier and faster. Don’t be afraid to use services like Instacart, Peapod or Amazon Fresh to make this part even easier on you! Once your meals are bought and planned, you can meal prep lunches for the week by cooking a recipe and separating it into different Tupperware containers. I always suggest having a few “plan b” dinners that you always have on hand so that if “plan a” doesn’t work out you are not left high and dry. For more information on meal prepping, check out our blog about meal prepping on Sunday. 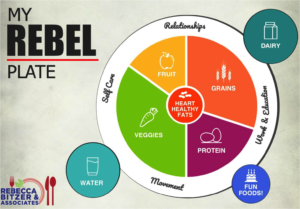 Try to plan based on the Rebel Plate. Aim for half your plate to be fruits and veggies to ensure optimal consumption of fiber, vitamins, and minerals. Plan to have a quarter of your plate be grains that are preferably whole grains. This can include bread, pasta, rice, quinoa, barley, etc. The last quarter of your plate is saved for protein. This can be either a lean meat or fish of preference. If vegetarian, beans and nuts also work. Try to pair your carbs with a protein to avoid blood sugar spikes and crashes. Foods high in carbs can include but are not limited to fruit, dairy, and grains/starches. Fats can be broken down into two classes; saturated/trans, which are unhealthy, and unsaturated, which are healthy. Make sure to read ingredient labels of foods for these before you buy. Saturated fats increase your risk for heart disease. These are found in butter, shortening and cheese. You do not have to avoid these fats entirely but portions are important. Trans fats increase bad cholesterol in the body and decreases good cholesterol. They’re typically used to preserve packaged foods, typically baked goods like cookies, cakes, and crackers, and should be avoided. Polyunsaturated fats are good, as they aid the body in blood clotting and muscle movement. Sources of these fats can be found in fatty fish, ground flaxseed and flaxseed oil, canola oil, sunflower seeds, sesame oil, and much more. Monounsaturated fats are also the other kind of good fat and can lower your risk of heart disease and help to control blood sugar. Sources of these fats can be found in olive peanut, canola, and sunflower oil, along with most seeds and nuts. For more information on the different types of fats, check out our blog post. You can increase the health of your meals based on your method of cooking. Steamed, grilled, sautéed, broiled, seared are preferred. You can use olive oil to drizzle over cooked foods or in low heat cooking (under 350 degrees) as it doesn’t not have that high of a smoke point. Sautéed or grilling can be at a higher temperature and avocado oil is a good choice since it can be heated much higher. Limit deep frying and semi frying as it soaks and coats your foods in excess oil. For more information on different cooking methods check out this blog! 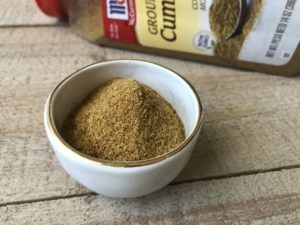 For more information about flavoring foods with herbs and spices, check out this blog! Have fun with your recipes! Experiment different foods together to make creations you can enjoy! I suggest trying out one new recipe a week. More than one can be more time consuming and who knows if it will turn out! In a jif? Checkout some of our 10-minute recipes! Contact us to find out how we can help you meet your specific nutrition needs at admin@rbitzer.com or call us at 301-474-2499. Blog contributions by Rachael May, dietetic intern.